The Buddha Poornima celebrations by overseas devotees at Prasanthi Nilayam got underway this evening with Bhagavan entering Sai Kulwant Hall in a procession led by traditional dancers from Sri Lanka just after 5.30 pm. Before that, Swami had gone to the hall next to Yajur Mandir and blessed the teachers of the Sai University who had gathered there for the preliminary session of a two-day orientation course for new teachers. Moving among the faculty members, Bhagavan interacted with some of them informally for around 10 minutes before He left for Sai Kulwant hall. The programme got underway shortly after Swami came onstage. Various items were presented to Him, including Sai Literature from Nepal and Sri Lanka. The Zonal chairman Dr. Ravindran introduced the two speakers for the evening, Dr. Art-Ong Jumsai, the Sai educator from Thailand and Mr. Sudhamek of Garuda Food Indonesia. After their brief talks, a drama entitled ‘Yashodhara’ got underway at half-past six. After the 35 minute drama, Swami sent clothes for the participants and accepted Arati. He went down for group photographs and blessed prasadam for distribution before returning to His residence at 7.30 pm. This evening, Bhagavan emerged from His residence a few minutes after the bhajans commenced at half-past five. He sat onstage after His darshan round and accepted Arati at 6.10 pm. After Arati, He called up a couple of Professors from the University and asked Prof. Veerabhadraiah who teaches Telugu at the Prasanthi Nilayam campus to speak. In his fifteen minute Telugu talk, the speaker conveyed what Swami has spoken about Lord Buddha and His teachings. Bhagavan blessed him with a chain after his speech before accepting Arati once again and returning to His residence. Students of Swami who had stayed back during their vacations presented compilation of dance and music this evening, ‘Lava Kusa Ramakatha’. Bhagavan came for darshan at a quarter past five and sat onstage for ten minutes after His darshan round listening to the Vedic chants. He then moved to the bhajan hall where the students were ready in costumes and spent ten minutes with them. Returning to the stage, He began the programme just after six o’clock. The 45 minute presentation of dances and songs on Lord Rama was narrated by ‘Sage Valmiki’. Bhagavan went down from the stage for group photographs and sent clothes for the performers. He also blessed ‘Mother Sita’ and ‘one of her sons’ with a chain and a ring respectively. It was a quarter past seven when Swami accepted Arati and returned to His residence. This evening, Balvikas gurus from North Kanara of Karnataka presented a music programme. Bhagavan arrived for darshan at ten to six and came onstage after His round of the hall. The group had prepared an album of 85 value songs and were ready with a selection to sing in the Divine presence. After listening to them for half an hour, Swami asked the students to sing bhajans. Ten minutes later, He accepted Arati. After a brief interaction with some of the students, He returned to Yajur Mandir. The weather at Prasanthi Nilayam has cooled down a bit, with overcast skies and brief showers bringing the temperatures down. The lists of provisionally selected students for the new academic year have been announced on the University website. Bhagavan came for darshan this evening as the Vedam went on and came onstage after His round of Sai Kulwant hall just as the 5.30 pm bhajans began. He blessed some of the students and teachers sitting in the front with vibhuti packets before He accepted arati at 6.15 pm and returned to His residence. Swami came for evening darshan today after the bhajans began. After His darshan round, He sat onstage for a couple of bhajans before asking for His microphones to be brought. From 6.10 pm, Bhagavan addressed the gathering, narrating the stories of Savitri and Harishchandra. He stressed the importance of chastity, harmony and fidelity in the family and that these are as important for men as for women. The students sang a bhajan before Swami accepted Arati at a quarter past seven and returned to His residence after blessing the congregation with both hands. This evening, the students of the Sri Sathya Sai University presented a programme of songs and dances. Bhagavan came for darshan at half-past five. After His round of Sai Kulwant hall, He came into the bhajan hall and interacted with the students in costumes there for ten minutes. Moving to the stage, He began the programme at ten to six. The fifty-minute programme had semi-classical devotional songs and dances and was narrated by ‘Sage Narada’. Bhagavan went down from the stage and blessed the participants with group photographs before accepting Arati and returning to His residence at seven o’clock. Last evening Bhagavan had come for darshan at six. Research scholars of Prasanthi Nilayam campus of the Sai University were seated in the bhajan hall. After His darshan round, Swami spent ten minutes interacting with the PhD students, moving among them and speaking to many of them. He then moved to the stage as the bhajans went on and accepted Arati after twenty minutes. He came for darshan this morning at 10.10, returning to His residence an hour later. In the evening, He accepted Arati as prasadam was distributed at hal-past six. He then blessed the staff member who came up to Him with a chain and later with vibhuti. Then it was the turn of a student who came up to receive a ring. Then He blessed the ‘Birthday boys’ one by one. It was nearly seven when Bhagavan returned to His residence. Swami has been coming for evening darshan over the last few days. Last evening as well as this evening, He went into the interview room after Arati. After remaining there for a few minutes, He had made another extended round of the verandah and even moved briefly onstage before returning to His residence at ten to seven. This evening also He moved around the verandah for a second time before returning to Yajur Mandir. Mother’s day is celebrated today, the second Sunday of May, in many parts of the world. Bhagavan asked Sri Ajit Popat of the UK and Sri B. N. Narasimhamurthy, Warden of the Brindavan Hostel, to speak this evening about Mother Eswaramma. After He arrived for darshan at a quarter to five, Swami sat for a few minutes onstage before calling up Sri Popat. After the two talks, Bhagavan accepted Arati at a quarter past six and prasadam was distributed to all. On this Eswaramma Day morning, Bhagawan emerged in His car at just before ten o’clock to proceed to the Samadhi of His parents. There, a private function was held inside the inner sanctum with a song being sung on Mother Eswaramma. Half an hour later, Swami returned to Sai Kulwant hall. There, He sat for a while onstage before moving through the bhajan hall for a second round of the gents’ side in front of the students. Prasadam of Tamarind Rice and Sweet Rice was distributed to all in leaf plates. Swami accepted Arati at 11.15 am and an announcement was made about the evening programme. It was half-past eleven when Bhagavan returned to His residence. In the evening, Swami came for darshan at ten to five. After His round of Sai Kulwant Hall, He came into the bhajan hall and interacted with a group of educators seated there who are to begin a new project based on Sathya Sai Education along with the Sri Sathya Sai Seva Organisation. Spending half an hour with this group, Bhagawan came onstage to begin the balvikas presentation after 5.30 pm. The story of Bhadrachala Ramdas was presented through many songs and dances in the fifty minute English drama by Balvikas children from Bangalore. Swami sent clothes and vibhuti prasadam for the children and they came onstage batch by batch for group photos with Him. The students sang bhajans for fifteen minutes before Bhagavan accepted Arati at seven o’clock. He then interacted some more with the Karnataka state Sai Organisation President onstage before returning to His residence. On the eve of Eswaramma Day, this evening, Bhagawan came for darshan 4.45 pm in His car. He moved to the Samadhi through the central gate of Sai Kulwant hall. Statues of Mother Eswaramma and Sri Pedda Venkama Raju garu were readied there. Swami formally unveiled these statues and asked for coconuts to be broken. Spending almost fifteen minutes there, Bhagavan accepted Arathi before returning to the Mandir just after five o’clock. Alighting near the interview room, Bhagawan spent sometime outside the interview room before proceeding to the bhajan hall. He then came onstage as the Vedam went on and sat onstage for the next half-hour. When Swami moved to the interview room, Bhajans began at a quarter to six. When Swami returned to the stage after half an hour, He accepted Arati. An announcement was then made about the Eswaramma day celebrations tomorrow. Bhagavan came for evening darshan at ten to five. After a full round of Sai Kulwant hall, He went on a second round of the ladies’ side before coming onstage. He sat listening to the Vedic chants there till nearly 5.30 pm, when He moved to the interview room. Emerging half an hour later, Swami moved to the Bhajan hall briefly before returning to the stage to accept Arati a few minutes later. This evening also Bhagavan came for evening darshan in the car. Moving through the centre gate of Sai Kulwant Hall, He left for a drive through the village before returning after nearly half an hour at 5.40 pm. He then sat onstage till Arati just after six o’clock. He then had some interactions in the interview room and later in the the Bhajan hall, returning to His residence after half-past six. This evening, preparations were made at the Samadhi of Swami’s parents for His arrival. Bhagavan arrived for darshan in the car just before half-past four and directly came to the stage. He sat there as the Vedam went on for half an hour. Spending the next fifteen minutes in the interview room, He went to the Samadhi and saw the arrangements made there for the Eswaramma day celebrations on May 6th. Returning to the Mandir as the bhajans went on at 5.40 pm, He sat onstage till Arati at 6 pm. Bhagavan came for darshan by five o’clock last evening. He sat onstage listening to the Vedic chants till He accepted Arati at six. Before Arati, He called up one of the students in the bhajan group and blessed him with a chain. This evening, He came for darshan just before half-past five. Half an hour later as Arati concluded and one of the students came up to Him with a rose, Swami blessed him with a chain. He then sat onstage interacting with the students for ten more minutes before moving to the interview room. At 6.30 pm, He emerged to return to His residence after a short visit to the bhajan hall. The alumni of Prasanthi Nilayam and Brindavan campuses of the Sai educational institutions, the Sai Students, are here in large numbers for their annual meet. This evening, they presented a drama. Bhagavan arrived in Sai Kulwant Hall ten minutes after five and moved to the Bhajan hall after His darshan round. There, He interacted with the participants in the drama who were ready in their costumes. Fifteen minutes later, He came onstage and began their drama at a quarter to six. The innovative 50 minute presentation used a video screen as a backdrop and had mythological characters narrating the story of students and Swami. Bhagavan went down among them for group photographs and accepted arati at a quarter to six as prasadam was distributed. He then interacted with the alumni for a few more minutes before returning to His residence at seven o’clock. The Chief Minister of Maharashtra was also in the congregation this evening. This evening, devotees from Indonesia presented a musical programme. Swami arrived for darshan at five o’clock and began their programme twenty minutes later. After their programme of songs, Bhagavan asked them to sing bhajans. He blessed one of them with a chain and went down among them for group photographs. After Arati, Sathya Sai Baba moved to the interview room briefly before returning to His residence at seven o’clock. Balvikas children from Delhi and the National Capital Region (NCR) presented a programme of music and dance this evening. Sathya Sai Baba arrived for darshan at ten to five and He asked for their programme to commence after His darshan round. The children presented colourful dances for half an hour. Swami then asked them to sing bhajans while prasadam was distributed. The children sang for twenty minutes before Swami blessed one of them with a chain and accepted Arati. A large contingent of devotees from Croatia, Macedonia, Serbia, Slovenia and Bosnia-Herzegovina presented a musical programme this evening. Bhagavan arrived for darshan by 4.20 pm and after His darshan round, went among the group, blessing many with vibhuti. He then started moving among all of them when they seated themselves in rows, distributing vibhuti in packets to them. This interaction went on for more than an hour, and it was 5.40 when Swami sat onstage for their programme to begin. The devotees began with five minutes of Vedic chants, mindful of correct intonation and pronunciation. They then sang songs from their respective countries for half an hour. Swami sent clothes for them and asked them to sing bhajans, so they sang with the ladies and gents alternating in leading the bhajans with group singing. It was nearly seven when Bhagavan accepted Arati. He then asked Prof Anil Kumar to announce that He was very pleased with the group’s performance and that He blesses all of them. Blessing the congregation with both hands, Sathya Sai Baba then returned to His residence. This evening, the children from overseas were to present their choir and Christmas play. The children from Latin America were presenting the play this year. Swami arrived for darshan just before half-past four. The programme commenced at ten to five with Ganesh gayatri and went on for half an hour of lilting Christmas melodies and Sai songs. The half-hour Christmas play then commenced, presenting the stories of Jesus and Sai as told by a mother to her son and interspersed with many songs. Satya SaiBaba blessed the participants with photographs and clothes before Arati just before half-past six. Christmas was celebrated in Prashanti Nilayam with festivity and joy. Sri Sathya Sai Baba arrived in silken white robe in the morning shortly after 9:00am. Cutting the Christmas cakes that had been arranged in the portico, Swami arrived on the stage and there were two programmes. The first was by the University Brass band. This was followed by carol singing by the students. After two Santas added to the festivity of the occasion, Swami received Aarthi and left.The evening programme consisted of two speeches by Ms. Yuliana Pulgar and Mr.Douglas Saunders respectively. This was followed by the Divine discourse at the end of which Swami blessed a few Russian devotees with the joy of His interaction. The Christmas celebrations at Prashanthi Nilayam got off to a wonderful start with carol singing by the overseas devotees on Christmas Eve. Sri Sai Baba arrived in the evening and took a full round. Coming on the stage, He asked for the programme to begin. the singing went on for almost an hour and throughout Swami was engrossed in the lyrics of each song sung. At the end of the singing, He asked Mr.John Behner to announce the programme for the next two days. He also called a student who expressed heartfelt thanks to the overseas choir on behalf of all the University students. Blessing all the members, Swami retired to Yajur Mandir at 6:30pm. The dance group at the Prashanti Nilayam campus of the University completed five years of existence yesterday. Sathya Sai Baba blessed them to put up a performance commemorating this occasion and thus it was that there was a 40 minute long dance performance beginning at 5:15pm. Swami moved down the stage and granted group photographs for all the students involved before receiving Aarthi and retiring shortly after 6:00pm. The Sri Sathya Sai University had a special agenda with the Chancellor today. The University’s newly developed ERP (Enterprise Resource Planning) system was blessed and commissioned by Sathya Sai Baba in a small function held in the bhajan hall in the evening at 4:30 Hrs. The University Vice Chancellor, Registrar, Controller of Examinations and the Principal of the Prasanthi Nilayam campus were joined by a group of faculty members who had been working on the same seeking Divine Blessings on the memorable occasion. This University Management System would facilitate the easy administration, management and communication, both internal and external, of the University. After inaugurating it, Swami moved outside for the bhajans before receiving Aarthi. An exclusive batch of doctors along with families from the twin hospitals in Bangalore, SSSIHMS and Sri Sathya Sai General Hospital in Whitefield, came in with a strength of over 200 to bask in Sathya Sai Baba’s all-conquering Divine Love. As was the case with the previous group, this exclusive group of medicos and families was also blessed by Swami in a most thrilling session held in the bhajan hall that lasted for an hour. Swami spoke to them in Kannada and blessing them with photos moved outside for the bhajans. After bhajans, He received Aarthi and moved to yajur Mandir. There were no special programmes at Prasanthi Nilayam over the last week. The political disturbances in the rest of the state have not significantly impacted the Ashram and its immediate vicinity, though the travel plans of many were affected by the cancellation of bus services in Andhra Pradesh. Bhagavan Sri Sathya Sai baba has been coming before the evening bhajans commence on many days, and went for a drive a couple of days ago in the forenoon. Last evening, He had come for darshan before half-past four, and had blessed the ladies’ side with a second darshan round before five o’clock. Functionaries from the defence services of Sri Lanka and India had visited Prasanthi Nilayam over the last few days, and today the Chief of the Army Staff of Nepal had an audience with Bhagavan. Swami blessed many of the members of his group with vibhuti and also asked for distribution of a booklet and prasadam before He accepted Arati. After Arati, He blessed some of the birthday boys from among the students and returned to His residence at a quarter-past six. Devotees from Singapore presented a drama this evening. Bhagavan Sri Sathya Sai Baba arrived for darshan at a quarter past four and after His darshan round, began their performance. The forty minute drama presented the concept of the Spiritual Bank which was based on a Discourse given by Bhagavan in 1966. At the end of the performance, Bhagavan blessed the group with photographs and gave a chain to one of the children. He then allowed the devotees to sing bhajans, which continued till ten past six when He accepted Arati and retired for the day. The Sri Sathya Sai Vidya Vihar of Visakhapatnam celebrates its 25th anniversary this year. The children and teachers of the school were gathered at Prasanthi Nilayam and presented a drama this evening. Bhagavan Satya Sai Baba came for darshan a few minutes before five and after His darshan round sat for a couple of minutes onstage before moving to the interview room. It was 5.20 pm when He came onstage and began their performance. The hour long drama showed the positive impact of Sai students on society. There were several dances punctuating their performance which ended with a group song. At the end of the performance, Bhagavan blessed the children with group photographs. This was followed by bhajans for twenty minutes following which Swami accepted Arati and returned to His residence at seven o’clock. As announced yesterday, this evening the Punjab youth were ready with their drama and a backdrop was set up in the centre of Sai Kulwant Hall. Bhagavan arrived for darshan just after five o’clock and came onstage after His darshan round to begin the programme. A half-hour drama ‘Vande Sai Mataram’ was the first presentation, followed by a short music programme. Swami blessed the participants with group photographs and gave a chain to one of them. It was half-past six when He returned to His residence after accepting Arati and blessing the singers. This evening, youth from Bengal presented their programme. Swami arrived at half-past four and after His darshan round, came onstage to begin the presentation. A forty-minute drama ‘Transformation from Individual to Global’ then began. Swami sent clothes for all the actors and moved down from the stage to interact with them, asking for bhajans to begin after He returned onstage. Accepting Arati after fifteen minutes of bhajans, Bhagavan returned to His residence at six o’clock after an announcement about the cultural programme to be presented tomorrow by the Punjab youth. Mr. Ratan Tata, Chairman of India’s largest business group, visited Prasanthi Nilayam today, along with his colleague Mr. Krishna Kumar, Vice-Chairman of Indian Hotels Company. Before evening darshan, all the college students and the visitors from the Tata group were seated in the College auditorium. Bhagavan came for darshan at half-past four to Sai Kulwant Hall in the car and directly moved to the College auditorium for a drama presentation by the students there. After the drama, Swami interacted with the participants onstage for more than half an hour before returning to the Mandir where the bhajans were going on. He accepted Arati from inside the Bhajan Hall after getting down from the car at a quarter to seven and then interacted with Mr. Tata and Mr. Krishna Kumar for fifteen minutes there before returning to His residence in the car. Swami was coming before the evening bhajans began for the last few days, and returning to His residence in the chair itself. Yesterday, He came for darshan at 4.45 pm and moved to the interview room. After the five o’clock bhajans began, He went in the car to the college auditorium and saw a drama rehearsal by the students there. Returning after an hour, He accepted Arati at 6.20 before returning to His residence. Today, darshan was at 5.15 pm, after which Bhagavan gave interviews till past seven when He came onstage to accept Arati. He then asked the students to chant ‘Samasta Loka Sukhino Bhavantu’ three more times before He blessed the congregation and returned to His residence. Prasanthi Nilayam was brimming with devotees and people from the nearby villages on Bhagavan Sri Sathya Sai Baba’s 84th Birthday. Tea and tiffin was being served at many counters all over the Ashram as a service by Maharashtra devotees. Arrangements were made to seat devotees in the Poornachandra auditorium also, with a large screen set up there. CCTVs and projectors were arranged in Sai Kulwant Hall for devotees to have a closer darshan. Swami emerged from His residence clad in a white robe seated on the white chair just after ten o’clock. He first moved to the Poornachandra to grant darshan to those seated there. The procession then began five minutes later, moving to the Sai Kulwant Hall from Yajur Mandir. The Anantapur brass band, the Primary school girls bagpipes, the Primary School boys recorders and drums, the University brass band and vedam chanting students led Bhagavan to the Mandir. After blessing the large cake kept on the verandah, Swami came onstage and sat there for fifteen minutes as the Vedam chanting went on and the bands played one after another. He then asked for the Malladi brothers to sing. Their vocal concert was for 45 minutes. Swami then asked for the evening programme to be announced, and blessed prasadam for distribution as the bands played again. Arati was offered at 11.45 am. Bhagavan then moved to the bhajan hall where cakes by the various institutions were arranged. He blessed all the cakes and returned to His residence at noon. In the evening, Sathya Sai Baba arrived in Sai Kulwant Hall at half-past five in a golden robe and came onstage after His darshan round to begin the programme by English singer Ms. Dana Gillespie at 5.45 pm. After her 45-minute performance, the Malladi brothers again sang for an hour. Swami blessed them with shawls and gave clothes to all the artistes, and they sang one more song before Swami accepted Arati at 7.30 pm before returning to His residence. The 28th annual Convocation of the Sri Sathya Sai University was held today. Bhagavan Sri Sathya Sai Baba came to Sai Kulwant hall in His car to oversee the arrangements at 8 o’clock and the congregation was allowed into the hall half an hour later as announced yesterday. The Convocation procession got underway from Yajur Mandir just before 10.00 am. Bhagavan, wearing a maroon robe and seated on the special white chair, was led into the hall by the University brass band and students bearing the ceremonial mace and insignia. The Vice-Chancellor’s address was followed by the presentation of gold medals and PhDs. The Convocation address was by Dr. Samuel Sandwiess from the United States. At 11.15, Bhagavan began His hour-long Benedictory Address as the Chancellor of the University. He exhorted the students to never forget Divine Love wherever they may be. Before concluding, He once again asked them to uphold the ideals of the institution and to love and respect their parents. After His Discourse, Swami asked the students to sing a group song before the proceedings concluded with the National Anthem. In the evening, Swami came for darshan at 5.10 pm and after His round of the hall, He blessed a cake presented by the Hospital staff on the 18th anniversary of the Super Speciality Hospital here. He moved to the bhajan hall where the “Little Champs”, the singers for the evening were seated and then to the interview room. He emerged from there to take a round of the verandah and sit onstage, talking to the Maharashtra Chief Minister there and calling up singer Smt. Bombay Jayashree to give a performance at 6.20 pm. After her half-hour performance, Swami blessed her and the accompanists with clothes and called up the five children who were to sing next. These children had sung before Satya Sai Baba at Hadshi on His Maharashtra trip last month. After they sang for 50 minutes one by one, He asked for some songs with Swaras, and the two boys obliged. He then blessed them with shawls and the girls with sarees, interacting with them and listening to two more song by all of them together. After blessing the artistes with clothes and apple prasadam, it was half-past eight when Swami returned to His residence. This evening, the students of the Sri Sathya Sai University presented their Convocation drama. Bhagavan arrived for darshan at ten minutes to five and came to the bhajan hall where the students were seated in costumes. Interacting with them for a few minutes, He moved down the aisle and up the verandah to go to the interview room. From there, He emerged to come onstage and begin the presentation at a quarter to six. The hour-long drama ‘Vidyaamrutam’ brought out Swami’s ideal of providing education free of cost, against all odds. Swami blesssed the participants with group photos and clothes at the conclusion, He had blessed the protagonist of the play with a chain during the drama itself. He asked for some songs to be sung, so the students sang a bhajan and a group song before Swami accepted Arati. He interacted with the students for some time even after Arati and it was past 7.30 pm when He returned to His residence. An announcement was made about the 28th Convocation of the University which is to be held tomorrow morning. This morning, Bhagavan Sri Sathya SaiBaba came for darshan an hour after the nine o’clock bhajans began. He moved to the bhajan hall after three rounds of the ladies’ side of Sai Kulwant hall selecting ladies for saree distribution, sending them to the bhajan hall. In the Bhajan hall, He gave sarees to the ladies gathered there. The students of the music college got a cake blessed since it was the anniversary of the inauguration of their institution. It was half-past eleven when He accepted Arati onstage after the distribution. In the evening, the students of Sri Sathya Sai Primary School presented a drama on the story of Mother Sita. Swami was welcomed into Sai Kulwant Hall at 5.10 pm with the bagpipes band of the Primary School along with students dancing and chanting Vedam. Once Bhagavan reached the stage after His darshan round, a brief round of distribution of mementos was done on behalf of Eswaramma Womens’ Welfare Trust. The fast-paced forty-minute Primary School drama commenced at 5.40 pm. After the drama, Swami called up the participants onstage to have group photographs with them and sent them prasadam. The bagpipes band then performed a couple of pieces before Swami accepted Arati and returned to His residence at a quarter to seven. November 19th has been celebrated as Ladies’ Day by Bhagavan and all activities are done by ladies on this day. Smt. P. Susheela began the day by chanting the Suprabhatam at half-past five and the Vedam chanting before the Nagarasankirtan was also by Swami’s girl students as on earlier years. The programme in Sai Kulwant hall began ten minutes after nine with Swami being welcomed by a procession consisting of the Anantapur brass band and Vedam chanting students. After His darshan round Swami lit a lamp onstage just before 9.30. There were two speakers, with an introductory speech by Mrs. Chetana Raju. Mrs. Sharon Sandwiess of the USA and Mrs. Harriet Tay-Agbozo of Ghana spoke of their experiences with Bhagavan. The speeches were followed by five-minute dances by children from the Sai schools of India, Indonesia, Mexico, Fiji, Thailand and South Africa. After their presentation, Swami went among the participants and gifted them with photo frames. It was 11.15 when He came back onstage and asked for bhajans by the ladies to begin. Ten minutes later, He accepted Arati and left for His residence after blessing the giant cake placed onstage. In the evening, Sathya Sai Baba came for darshan at 4.45 pm, led by Vedam chanting students and the Primary school bagpipes band, flanked by small girls bearing welcoming plates with lamps. The programme commenced at five o’clock with choirs by devotees from Greece and other European countries. The music was followed by a 70 minute Telugu drama ‘Draupadi Charitra’ by devotees from Hyderabad. After the drama, Swami blessed “Draupadi” with a chain and went down for group photographs. He then called them up one by one to the stage to receive photo frames. It was past seven o’clock when Swami left for His residence after Arati. Sri Ashok Singhal of the VHP and Malayalam film star Sri Mohanlal were also among the congregation. This morning was the traditional Rathotsavam from Prasanthi Mandir to the Pedda Venkama Raju Kalyana Mantapam (Old Mandir), celebrated over the years on November 18th. Bhagavan arrived for darshan just after nine o’clock as the Vedam chanting went on, and came to the bhajan hall after His darshan round in the chair. The idols of Gopalaswami, Rama, Lakshmana, Sita and Hanuman were kept there decked with jewels and flowers, ready on palanquins for the procession. 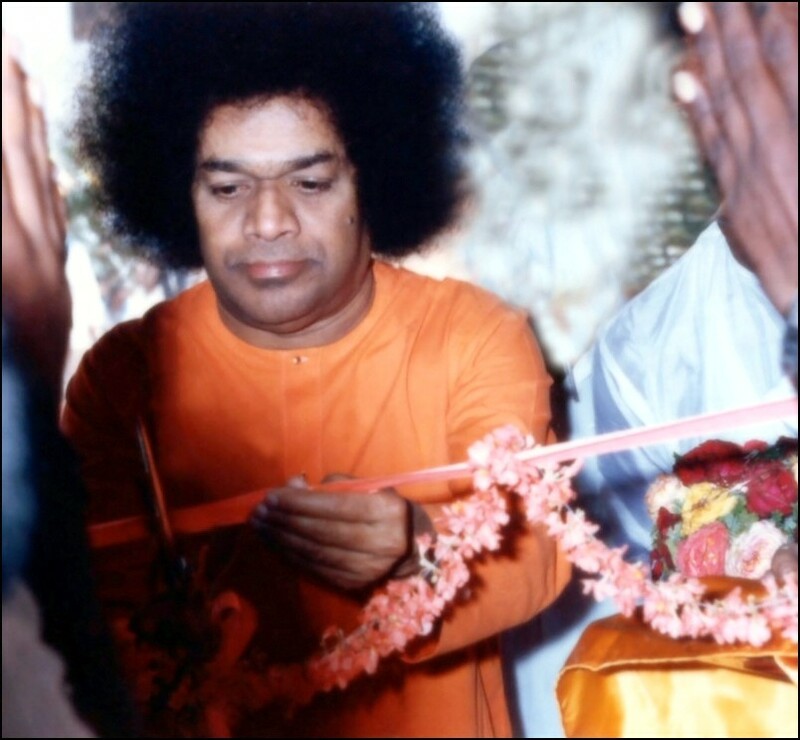 Sathya Sai Baba blessed the procession of Vedam and bhajan chanting students, and they began at a quarter-past nine. Once the procession reached the Gopuram gate where the decorated chariot (Ratham) was waiting, Swami went there and started the procession. When He came back onstage, the students chanted Vedam for a while, and later sang bhajans. The procession returned from the Kalyana Mantapam at 10.20, and Swami accepted Arati. In the evening, Swami emerged from His residence at half-past five as the bhajans went on and went to the Poornachandra auditorium to see the dress rehearsal of the Convocation drama by the University students. After spending more than an hour there, He came to Sai Kulwant Hall and moved to the interview room after His darshan round. Moving down the verandah, Swami sat for a few minutes onstage before accepting Arati after seven o’clock. An announcement regarding tomorrow’s Ladies’ Day celebrations was made before Bhagavan returned to His residence in the car. Last evening, Bhagavan had blessed the intra-mural captains of all the campuses of the Sai educational institutions at His residence after the bhajans. He had also asked for a Burrakatha presentation this evening. Accordingly, the Burrakatha students were ready in their costumes in the bhajan hall when Swami came for darshan at 5.30 pm today as the bhajans went on. Once He reached the stage after His darshan round, He asked for the Burrakatha to begin, and the Burrakatha group went onstage to commence their hour-long presentation on Mother Eswaramma and Karnam Subbamma at ten minutes to six. Swami also sat onstage watching them, and accepted Arati immediately after the programme. This evening, the youth from Tamil Nadu presented their drama. Bhagavan Shree Sathya Sai Baba came for darshan at 5.50 pm and after His darshan round, began their 45-minute drama entitled ‘Sathya Kathalu’. After the drama, some small girls who took part in it came up to Him with a card, and He blessed one of them with a chain. Clothes were sent for all the participants and Swami went down from the stage for group photographs. Even after He returned to the stage, He continued to interact with them till 7.15, when He asked for two bhajans to be sung with alap and then accepted Arati at half-past seven. He then visited the interview room for a short while before returning to His residence in the chair itself. The staff and their families from the Bangalore Super Speciality Hospital plan to come every month in batches for Bhagavan’s darshan. This weekend, the first batch of 120 members had come and were seated inside the bhajan hall for evening darshan. Swami came for darshan at ten minutes to five and after His darshan round, came into the bhajan hall as the bhajans went on in the Sai Kulwant Hall. He spent more than half an hour with the group, moving among them down the hall several times and later sitting in front of the hall to interact informally. After a short visit to the interview room from where He sent prasadam for the group, He moved to the stage area. The Tamil Nadu Youth who are on a Parthi pilgrimage then presented a half-hour music programme. Concluding the session with several bhajans, Swami interacted with several members of the youth group even after the Arati, returning to His residence at a quarter to seven. This morning, some cows to be donated to the Mantralayam temple were brought to Sai Kulwant Hall. When Bhagavan came for darshan during the bhajans, He blessed some of the cows. Later, after He came out of the interview room, the cows again came forward and Swami went down to bless them in the centre of the hall. This evening, He came for darshan in the car at a quarter to five and moved out to go to the college auditorium for watching the rehearsal of the Convocation drama by the students. Returning at 6.15, He moved to the interview room and bhajan hall, coming to the stage area after 6.30 to accept Arati. The Akhanda bhajan continued throughout the night and the loudspeakers were switched on at eight o’clock this morning. Sathya Sai Baba came to the bhajan hall at a quarter to ten. He moved down the aisle, sat for some time outside on the Sai Kulwant Hall stage area, and returned to the Bhajan hall, remaining there till half-past twelve! He went to Yajur Mandir and returned at half-past five. Once again He moved down the aisle and sat for a while outside, then returned to the bhajan hall before six o’clock. Even after six o’clock, He kept indicating for bhajans to be sung, till He finally asked for the Arati ten minutes later. Prasadam of tamarind rice and sweet rice was then distributed to all on leaf plates even as Swami watched. He then interacted with some of the lady teachers who lead bhajans, gave them sarees, then gave sarees to some of the married men from the bhajan group for their wives. The interaction continued for more than half an hour, and it was 7.10 pm when Bhagavan returned to Yajur Mandir, blessing the devotees on the way. Last evening, the Karnataka Education Minister was here for Swami’s darshan. The 24-hour Global Akhanda bhajan began this evening at six o’clock. Today was also Bhagavan’s birthday by the Telugu calendar. While He came for darshan at 4.20 pm, Swami called up several ladies and sent them to the bhajan hall. He moved twice around the ladies’ side doing this selection before completing His darshan round. Coming to the Bhajan Hall, Swami distributed sarees to all the ladies, more than fifty of them. He then moved to the verandah and later to the stage area as the Vedic chanting went on. At half-past five, He came into the packed bhajan hall readied for the Akhanda bhajan. Interacting with some of the teachers and students there, He moved down the aisle and sat there till nearly six o’clock when He asked for the bhajan to begin and lit the 24-hour lamp. At half-past six, He returned to His residence, only to return to the bhajan hall at a quarter to eight. Once again He blessed the singers in the bhajan hall with His presence, moving down the aisle and taking a round of the Sai Kulwant Hall also. Finally, it was a quarter to nine when He returned to Yajur Mandir. From nine o’clock, the bhajan continued without microphones. After returning from His Maharashtra visit, Bhagavan has been coming for darshan after half-past five as the evening bhajans go on. This evening, after Arati, prasadam was distributed to all. As Swami got into His car to return to His residence, He blessed the group of people who co-ordinated the Maharashtra visit and gave them vibhuti prasadam. Bhagavan Sri Satya Sai Baba arrived back at Prasanthi Nilayam this evening after His five-day Maharashtra visit. The Books and Publications website has updates on the visit. Bhagavan’s chartered plane landed at the Sri Sathya Sai airport here just after five and He arrived in Sai Kulwant hall half an hour later to a colourful procession with Vedic chants and a couple of welcome songs by the students. Swami moved to the interview room and the evening bhajans went on till He came onstage five minutes later to accept Arati and return to His residence at ten minutes to six. Our columnist has a spiritual time in a remote village in India. INTRIGUED by his teachings on human values and the fact that he has followers in 170 countries, I travelled to Puttaparthi, India, last weekend to experience Sathya Sai Baba’s darshan (blessings). Puttaparthi is a remote village in Andhra Pradesh state in India’s south-east that has been placed on the world map as a top pilgrimage centre owing to the presence there of Baba, who is considered a living god by more than 100 million followers worldwide. The shops, hotels, banks and other business outlets in the village all depend on the floating population of thousands who come there from all over the world throughout the year to seek Baba’s blessing and peace of mind. My first glimpse of Sathya Sai Baba is when shopkeepers rush out of their stores to join the crowds lining the main street – Baba is passing by in a car escorted by police and volunteers, returning to his abode. He’s returning from a visit to the Sri Sathya Sai General Hospital, which treats the poor for free and also handles cases related to cardiology, urology, nephrology and ophthalmology. I later discover that to get into Baba’s Prasanthi Nilayam (Abode of Peace), one must go through airport-style security checks, including going through a metal detector and being frisked. And just like on an airplane, cameras, mobile phones, pens and sharp objects were prohibited. Men and women are separated to opposite sides of the huge hall. The day that I’m here, Nov 7, is special because on the second Saturday of November every year, devotees in Puttaparthi and at Sai Baba centres worldwide sing bhajans (devotional chants) continuously for 24 hours to confer peace, joy, harmony and bliss to all of mankind. Thousands of vocalists sing with full devotion and the divine vibration is said to have the power to remove negative thoughts, soothe the nerves, purify the mind and heal those within earshot. I am overwhelmed by the vibrations of the sacred sounds the moment I step foot into the holy space. Seated in a lotus pose in silence, I feel a sudden surge of energy rushing into my body when Satya Sai Baba arrives in a wheel chair. Wearing a saffron coloured robe, Baba seems, to me, electrifying – so much so that I feel goose pimples, and tears well up in my eyes. Some of his devotees tell me later that such experiences are common in the presence of a “realised master” because his mind is saturated with “God consciousness” and a great ecstasy will develop within any individual close by, without any mental or intellectual effort. Sathya Sai Baba is pushed slowly along an aisle lined on both sides by over 10,000 devotees; he stops occasionally to receive letters and wedding invitation cards from his followers, and some cry with love and joy when he’s close. He does not speak but gazes deeply into the eyes of everyone he comes into contact with; when he reaches the dais in front, he sweeps his eyes over all his devotees. His disciples clasp their hands in prayer and bow, while the crowd basks in the peace he is emanating. Sathya SaiBaba was born on Nov 23, 1926, and, right from his childhood, there were consistent manifestations of his divinity. For instance, his birth was accompanied by strange phenomena – like the musical instruments in his house playing on their own and a cobra lying unthreateningly under his bed. Even as a small child, he was against violence and refused to touch meat; by the age of four, when most children have not learnt to share yet, he began displaying compassion and generosity. At the age of 14, he declared to his family that he did not belong only to them and set out with others who believed in him to launch his divine mission in the service of mankind. He would enchant his followers by doing things like distributing sweets from an empty bag, plucking a variety of fruits from a tamarind tree, and creating holy ash in his hand. One of his strongest messages then was to surrender completely to him, that he would take over his followers’ worries and fears. According to Baba, surrender means not having expectations, not being upset if the outcome of events is different than anticipated. He says he can only help when an individual completely entrusts him or herself to him totally. Baba says energy passes from him to devotees in his presence, and that whatever his eyes see will be vitalised. In the meeting hall, I am five rows away from Sathya Sai Baba and cannot pass him the letter I am carrying for a Malaysian devotee – but Baba stares at me and then at the letter I am holding, and, somehow, I feel that he knows its contents. Baba does not perform any miracles that day but some of his devotees experience visions and say they feel a sensation of relief and contentment in his presence. I feel lighter and almost blissful after the two hour session in Sathya Sai Baba’s company. Many who arrive there come “expecting” but return “accepting” the true purpose of life and of the power of love and compassion. The columnist will present a talk on how to choose an auspicious property and create a happy home following Vasthu Sastra principles at 2pm on Nov 27 at The Star Property Fair at Hall 4, Kuala Lumpur Convention Centre. Admission to the talk is free. To register, call 012-329 9713. Senior News Editor T. Selva has spent years researching and writing about the ancient Indian science of construction, better known as ‘Indian feng shui’. He is the first disciple of 7th generation Vasthu Sastra Master Yuvaraj Sowma from Chennai, India. The Star does not give any warranty on accuracy, completeness, usefulness, fitness for any particular purpose or other assurances as to the opinions and views expressed in this column. The Star disclaims all responsibility for any losses suffered directly or indirectly arising from reliance on such opinions and views. AN INVENTOR from Runcorn has visited an Indian holy site to promote his green ideas to businessmen. Last week Prithvi Datta, a retired refrigeration engineer from Castlefields, and his son arrived in Prasanthi Nilayam – a remote village in the southern Indian state of Andhra Pradesh, to gather support for his carbon-cutting ideas. While in the holy village, also known as Place of Peace, Mr Datta will propose a ‘solar dome’ invention to a team of social entrepreneurs from around the world. Mr Datta, who tests some of his inventions at his son’s Xpress laundry business in Widnes, said his Evergreen Model 18 Regenerative Energy System combines solar, greenhouse and chimney effects. Mr Datta hopes private and public bodies will back the project and a working prototype near Prasanthi Nilayam. He said the solar dome is more efficient and affordable than wind turbines or solar panels used alone. He said that with patents in place, he hopes the technology will be exported around the world. The trip to the holy village kicks off a five month tour for Mr Datta. The majority of the tour will be spent in India, where he is advising the West Bengal Regeneration Energy Development Agency on green energy. He will also visit Canada. “With blessing from Sri Sathya Sai Baba, the proposed dome will offer nine to 18 kilowatts of usable regenerative electrical power for a longer part of the year, than individual solar or wind turbine system. With Sathya Sai Baba’s Grace a great reduction in carbon emissions and burning fossil fuels will be possible when the power is not used from the national grid or standby generators. Last Friday, the Chief Minister of Andhra Pradesh Sri K. Rosaiah came here for an audience with Bhagavan Sri Sathya Sai Baba. For the last couple of days, Swami has been returning to His residence in the chair itself, with the car having been sent to Pune in preparation for His visit there. This morning, Swami left for Pune by air on a short Maharashtra visit. Accepting Arati from the car itself, He left the Mandir for the airport just before 8 o’clock. There, He unveiled a small Hanuman statue before boarding the chartered flight which took off at half-past eight. From Pune, Bhagavan will move to Hadshi, around 40 kilometres away and stay there for a couple of days. The devotees from Gujarat celebrated their New Year today. Bhagavan Sri Sathya Sai Baba was welcomed into Sai Kulwant Hall just before half-past five this evening as the bhajans went on with a small girl in traditional dress holding auspicious items. After Swami completed His darshan round, He came onstage and sat there till ten minutes to six, when He permitted the musical performance by the Gujarat devotees. Santoor and Jal-tarang recitals for twenty minutes were followed by a half-hour drama by the balvikas children based on Adi Shankara’s Bhaja Govindam based on Bhagavan’s Chinna Kathas. Swami sent clothes for the participants and accepted Arati at 7.10 pm as prasadam was distributed after He went down from the stage and blessed the group with photographs. Yesterday, the Union Civil Aviation Minister Sri Praful Patel and cricketer Sri Sunil Gavaskar were here for darshan. Deepavali was celebrated today in some parts of the country, and will be celebrated tomorrow in some parts. When Bhagavan Sri Sathya Sai Baba came for darshan at a quarter to five this evening, He asked for silver lamps to be distributed to more than a thousand ladies. After the evening bhajan when He returned to His residence at a quarter to six, fireworks and lamps were readied outside Yajur Mandir. He sat outside His residence watching the fireworks being lit for half an hour before retiring for the day. The last few days have been quiet at Prasanthi Nilayam. The students have their end-semester or end of term exams and there have been no programmes in Sai Kulwant Hall for the last two weeks. Bhagavan Sri Satya SaiBaba has been coming for evening darshan, and occasionally for morning darshan too. This evening, the Chief Minister of Maharashtra was among the congregation for evening darshan. The Maharashtra devotees are hoping for a Divine visit in the last week of this month. Preparations are being made to welcome Swami to a village near Pune called Hadshi and the Dharmakshetra website has pictures of the Sri Sathya Sai Pandurang Kshetra there. This morning, Swami came at 9.30 as the bhajans went on and granted an audience to the former Chief election commissioner Sri T. N. Seshan and the Governor of Rajasthan Sri Shilendra Kumar Singh who have been here for the last couple of days. In the evening, He came for darshan at half-past five and accepted Arati at six o’clock after prasadam was distributed. The Sri Sathya Sai General Hospital at Prasanthi Nilayam celebrated its anniversary today. Sathya Sai Baba came for morning darshan after 10.15 while the bhajans went on. After accepting Arati onstage after half an hour, Swami went to the Hospital and spent more than an hour interacting with the staff there. In the evening, He came for darshan at 5.50 and went to the interview room after a few minutes onstage. He emerged at seven o’clock and blessed prasadam for distribution before again moving to the interview room. At 7.15, He came onstage to accept Arati and return to His residence. The youth from Kerala who are on a pilgrimage to Prasanthi Nilayam in large numbers presented a drama this evening. Bhagavan came for darshan just before five and went to the interview room after His round of the Hall. Emerging at 5.40, Sathya Sai Baba asked for the hour-long drama on Saint Tulsidas to begin. After the drama, Swami sent clothes for the participants and called up some of them for photos onstage before going down for a group photo with all of them. Prasadam was distributed and Swami interacted some more with the youth, asking them to chant Vedam. After a bhajan by the students, He accepted Arati and returned to His residence at seven o’clock. Last evening, Prof. Anil Kumar announced that today the Japanese devotees would be presenting a drama. Accordingly, this evening they were seated in the centre of Sai Kulwant Hall with some space left for their drama. Bhagavan Sri Sathya Sai Baba came for darshan just before five o’clock and started their programme after His round of the hall. They began with five minutes of music on traditional Japanese instruments followed by some Vedam chanting and twenty minutes of bhajans, mostly in Japanese. Then their half-hour English drama on Adi Shankaracharya got underway. Swami blessed “Shankara” with a chain as the drama concluded with a recording of Swami singing “Bhaja Govindam”. He then went down from the stage for group photographs. Prasadam was distributed as the devotees sang some more bhajans before Swami accepted Arati at at 6.15 pm. MUMBAI: This sunday, Varsha, the Maharashtra chief minister’s official residence, will have a rather unusual visitor. The house that’s familiar with political bickering and has witnessed many a deal, will wear a saffron, spiritual look as Sathya Sai Baba will visit Varsha to bless his disciple Ashok Chavan. It’s the first time that the state will officially host a guru. Chief minister Ashok Chavan has always been very forthcoming about his admiration for the Baba. Every time he finds himself in a crisis, Mr Chavan makes a trip to Puttuparthy in Andhra Pradesh, the Baba’s abode. This time, too, soon after votes were polled for the state assembly election, Mr Chavan was at the Baba’s doorstep to seek his blessings for a political battle that later went in his favour. As a mark of gratitude, the state chief minister is learnt to have invited Baba to his official residence. Top officials from the state administration confirmed this to ET, requesting anonymity. A dedicated website, which tracks Satya Sai Baba’s movements, has also announced a meeting of a spiritual sect head with the head of the state this Sunday. “On November 1, Sathya Sai Baba will give a discourse at Gandhi Maidan, Worli Naka, South Mumbai at around 11 am and then lunch at the residence of Maharashtra chief minister Ashok Chavan, who was blessed to be the CM again as his Congress won with a big margin,” the website proclaimed. Before arriving at the state’s centre of power, he will also bless the newly-constructed Bandra Worli Sea Link by travelling over it. “Bhagawan’s car will also definitely grace the new Bandra-Worli sea link where balloons will be released by the Balvikas children of Mumbai. South Mumbai being the financial hub of the city, many top businessmen and corporate leaders will grace the occasion at both the venues in Mumbai,” the website said. This may be Sathya Sai Baba’s first visit to the state’s chief minister’s residence. But he is no stranger to Congress politicians. In fact, former prime minister the late Narasimha Rao was one amongst his most prominent devotees.